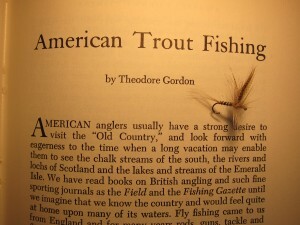 adapted dry fly techniques described by the Englishman Frederic Halford to the particular insect hatches of the Catskills, developing the Quill Gordon, the basis for a brand new class of dries, the Catskill dries. In my humble opinion, this group of flies remains THE iconic dry fly. Although I am now a dedicated tenkara angler, being an incorrigible dry fly fisher I feel a strong connection to the tradition of early dry fly anglers. Recreational angling in that era, as opposed to sustenance fishing, was rooted in the same impulses we feel today on the stream: serenity, appreciation of nature, challenge of fooling fish, river song. When my daughter invited my wife and me to spend a week with her and her family at the Frost Valley Camp in the Catskills, I was immediately on board. This would be a great opportunity to spend time with two of my grandchildren who live a thousand miles from me, doing a host of outdoor activities. When I viewed the online brochure for the camp an added bonus was the three miles of private access to the Neversink river which runs through the property. The Neversink! 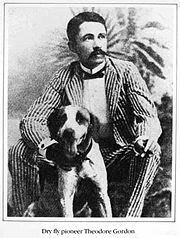 Theodore Gordon’s river. The brochure depicted a fly angler waist-deep in the river; I couldn’t wait. The Neversink, a moderate gradient freestone stream, begins as two parallel creeks, the East Branch and the West, flowing from the heights of Slide mountain, the Catskills’ highest “peak” at four thousand and some change feet elevation. At the little hamlet of Claryville, the two branches merge to form the mainstem Neversink, and eventualy the river is impounded in the Neversink reservoir where it becomes a tailwater, finally flowing into the Delaware. 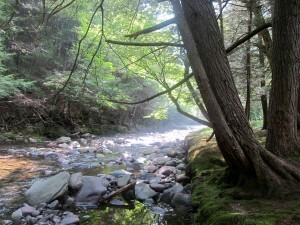 Arriving at the camp, I spied the West Branch Neversink for the first time. I’ll admit to a bit of disappointment. Instead of that wide river of languid flow depicted in the brochure, here was a shallow creek, perhaps fifteen feet wide, one to four feet deep. Unless you are a garden gnome, there is no waist-deep angling in this water. Could have left the waders at home. 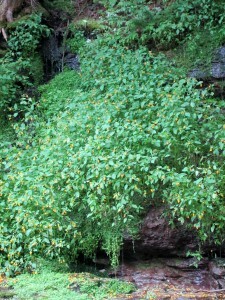 Perhaps the stream was at a seasonal low, but it did not look like the kind of water that would inspire the development of a new flyfishing paradigm. The following day, after having discharged some very enjoyable grandfather duties, my wife and I got on the stream for the first time. As we all do, I realigned my expectations for the fish I could expect on a stream of this size. 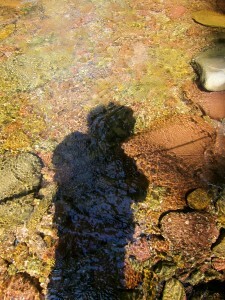 Crouching, I put my hand in the water; pleasantly cold and as clear as new glass. Parsing the water from an angler’s perspective, I realized that all the requisite elements of a trout stream were present, albeit in miniature: riffle water, slow water, plunge pools, and quiet pools. Smooth round cobble, from hen’s egg to boulder size comprised the streambed and bankside, requiring a bit of careful walking. The bank opposite from where I entered the stream was a natural stone wall, water dripping from faults in the rock, sustaining the most attractive hanging gardens of fern and monkeyflower. Closing my eyes, I allowed the surroundings to work their magic, the sound of flowing water on stone calming as Mother’s lullaby. Although late August and yet summer according to Pope Gregory, Mother Nature was beginning to whisper of the coming autumn: a cool freshening breeze and sparse flecks of crimson and yellow in the hillsides of birch, maple, oak, and evergreen. My wife’s graceful casting of her five weight completed the angling mise en scene. Now I was ready to fish. 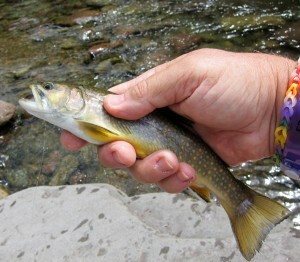 I extended my rod, attached a #16 Elk Hair Caddis, and began casting to all the promising spots. Moments later, I was attached to my first fish, a four-inch brookie, wild and native to these waters, colorful spots like gemstones scattered on dark, wet velvet. And so it went over the next few days. Eager brookies ambushing almost any fly presented. Parachute Adams, black deer-hair beetle, parachute ant, EHC, it didn’t matter. Finally, in what would prove to be my last hour of angling, I approached the water from behind the horse barn and corral, a dark and attractive wooded stretch, a handsome chestnut whinnying her advice as I fished, the earthy, somehow pleasant odor of manure in my nostrils. Soon I came upon a plunge pool, large for this water. If I were going to catch a large trout on this trip, it would be here. Before long, the Parachute Adams I had earlier tied on became waterlogged and would no longer float. 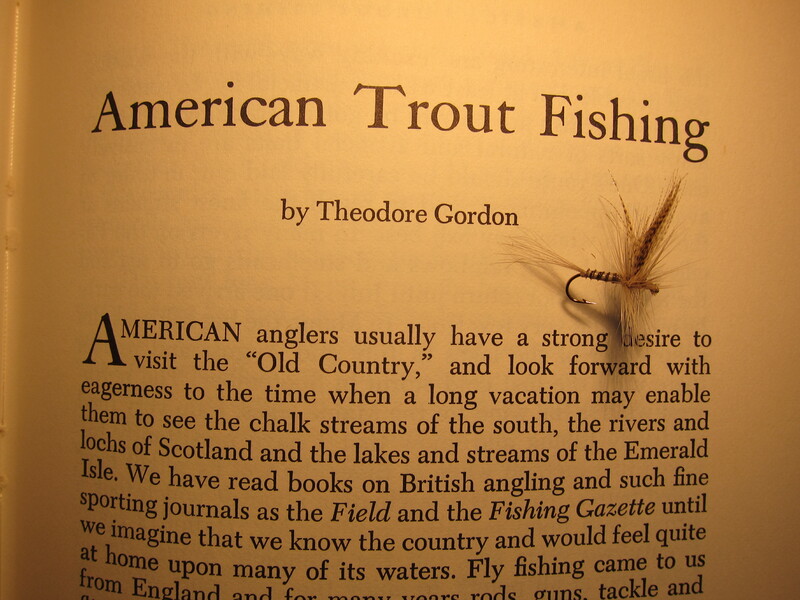 Then I remembered the single Quill Gordon I had tied for the trip, attached it to the tippet, cast to the head of the pool, and was almost immediately connected to what would be my largest fish of the trip, a seven-inch brook trout. Caught on Theodore Gordon’s river, on Theodore Gordon’s fly. Symmetry.